Status: offline What are the findings? Additional views will be posted in a few days. Status: offline ?Stress fx midshaft lateral aspect? Status: offline Jason, I agree, but I wonder if the stress fracture you see is from overlap with his shorts. "one view is no view"
Status: offline Yes, there appears to be a lateral fx lateral aspect of the thigh. I don't think it has to do with the shorts as the outer cortex seems intact on the medial aspect of the femur, at the same level as the shorts. Status: offline I'm not sure if I see what the others mentioned, but I do see some sort of ovoid or round opacity in the patella...just superior to the intercondylar notch. Status: offline Hopefully, the next set of images can clarify a few things. Status: offline Chris, I see what you're saying. I also see what the rest are finding, but might just be an overlap. Status: offline May be irrelevant, but the joint space isn't much (depends on the age of the person, I guess)and there seems to be something amiss with the spot on the lateral border that others have mentioned. Doesn't seem like a usual sort of fracture. Status: offline I see what Jason is looking at, but on this view I can't be sure that it isn't because of his shorts rolled up. What are those two little round opacities on the medial aspect two thirds of the way down? Status: offline Is it a stress fracture? There appears to be a change in radioluceny that is slightly oval within the central canal. It this a defect or am I imagining it is there? Our prayers are with you and those defending our freedoms. 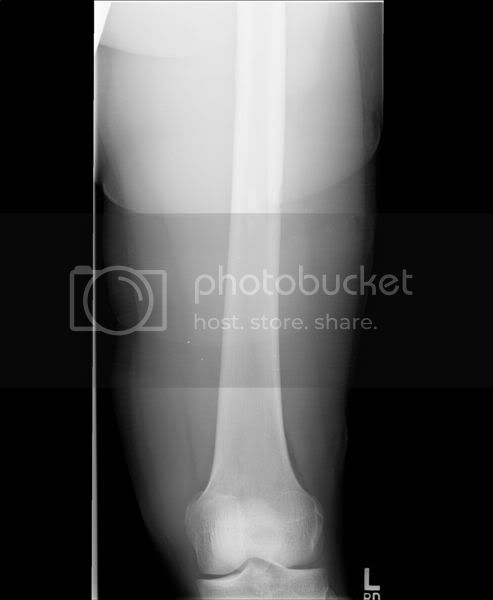 Status: offline No idea other than the lesion at the distal 1/3 of the shaft of the femur. It cant be good. Status: offline I'd agree..the periosteum appears eroded. 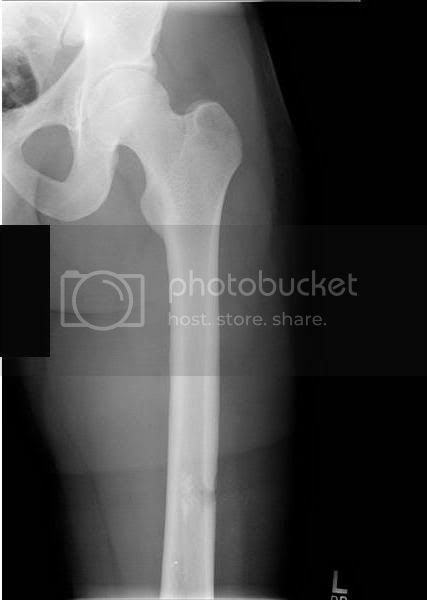 Status: offline Hmmm, there appears to be a mass in the distal 1/3 of the shaft of the femur. 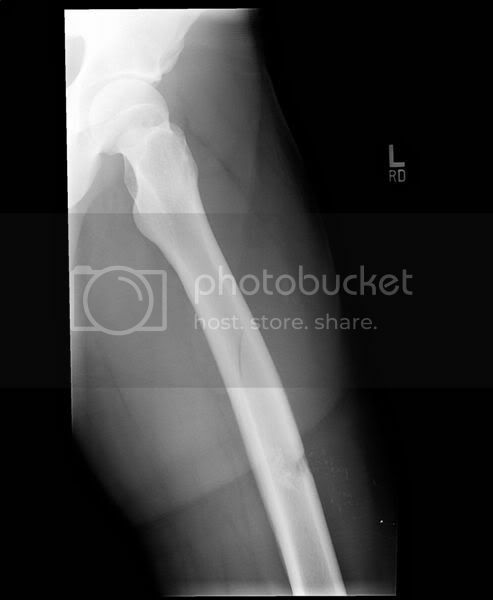 Could this be possibly a pathological fracture because of it? Status: offline Although there do not seem to be soft tissue changes..likely now to be a bullet, as Chris suggests. The black stripe could be an artefact, but..? a weird one. Status: offline I really do think it was a gun shot (bullet removed obviously). It looks to have entered the lateral femur but didn't go past the medial periosteum. There's tiny bone fragments just lateral to the lesion in the soft tissue. If it's not a bullet, then I'm way off. The black line above the 'hole' kinda looks like a spiral fracture...maybe from the force of the projectile. Status: offline I cannot imagine a .30 caliber round not going through and through, and doing a lot more destruction than that. I'm still at the base of the totem pole when it comes to interpreting films. I grew up around guns, but not gunshot wounds. I would think, as did you, that more damage would be present. However, depending on the situation and all the variables present with GSW, the bullet may have bounced off an object first before it decided to enter this young man's thigh. The scenario I painted may be unlikely, but still feasible.